The oceanfront estate in San Clemente that was once owned by Richard M. Nixon and known as the Western White House during his presidency is back up for sale at $63.5 million — down from its $75-million asking price three years ago. reports The Wall Street Journal. The seller is former Allergan Pharmaceuticals Chief Executive Gavin S. Herbert, who acquired the property and surrounding acreage from Nixon in the 1980s. The 9,000-square-foot main house, built in 1926, features tile and hardwood flooring, arched doorways and groin-vaulted ceilings. Among living spaces is the ocean-view office used by Nixon and a master suite with an expanded bathroom and closet area. 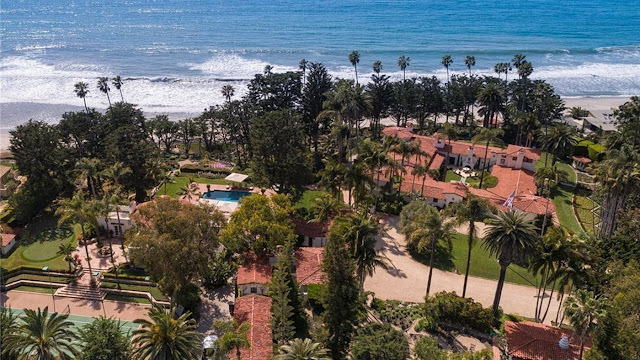 In addition to the Spanish Colonial Revival-style main residence, there's a two-bedroom guesthouse, multiple staff residences and offices, a greenhouse, a swimming pool, a tennis court, formal gardens and large expanses of lawn.